With Asian Olympic qualification spots on the line in the Men's and Women's 470, the stakes are high with sailors aiming to put down an early marker. As the Asian qualifier for the ‪Rio 2016‬ ‪Olympic Games‬, 470 teams from China, Hong Kong, India, Korea, Malaysia, Philippines, Singapore and Thailand are looking to book their spot. Racing has been hard and tough across the nine fleets competing in Qingdao with Abu Dhabi final spots, a share of the 150,000 Euro prize fund and World Cup medals on the line. 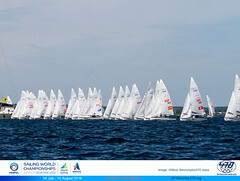 Qingdao's strong tide, as well as a variable breeze put the 320 sailors from 32 nations to task with plenty of ups and downs. In the Men's 470, China's Hao Lan and Chao Wang lead at the top with a bullet and fourth place from the day to finish on eight points. The good results mean that a 19th place yesterday is discarded. The Chinese pair lead Spain's Onan Barreiros and Juan Curbelo Cabrera who are in second on the leaderboard with 11 points as they discard an OCS and count a sixth place. The first bullet of the day went to a much improved Yong Chen and Youjian Wen of China, who also took a seventh but still find themselves someway down the leader board with average results from the opening day of racing. 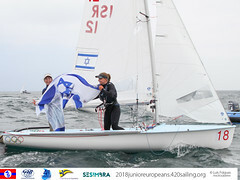 The Women's 470 sees Japan's Ai Kondo Yoshida and Miho Yoshioka on top with consistent finishes over the two racing days with another two second places and six points overall. Just behind with bullet and a discarded ninth place are Chinese duo Shasha Chen and Haiyan Gao on eight points. 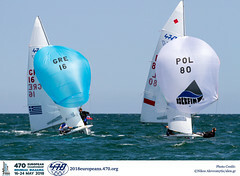 Jiaxin Li and Shaung Tian from China scored a 12th and two 15th place finishes in the first three races of the regatta, but managed to turn that around with a bullet in the final race of the day. They will hope that will trigger a good string of results for the rest of the week rather than a one off.